If valuable raw materials need to be added accurately to produce the right mixture the METTLER TOLEDO line of terminals and scale bases is the right choice. Minor shifts or variations in minor ingredients mean failure while repeatable adherence to the formula delivers profits. METTLER TOLEDO can provide automated, semi-automatic, and manual terminals to suit your specific needs. Our FreeWeigh and FormWeigh SQC/SPC programs continuously monitor the process and deliver the report tools to ensure your filling process remains in tolerance. 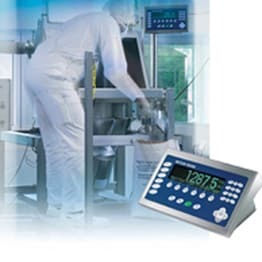 METTLER TOLEDO terminals are combined with high performance scale bases, weigh modules, or measuring cells to provide the complete solution for your application. Before you make your next formulation let Mettler Toledo show you the right mix for success. Form-690 Application Module adds advanced features to the capabilities of the IND690 terminal to manually control the formulation needs for a configurable (not stored) formula comprised of up to 15 materials. FormXP-690 The advanced communication features and PC connectivity of the IND690 terminal combined with the FormXP application software make a powerful and highly flexible solution to meet your production needs. FormWeigh.Net is the optimal solution offering in standalone version and Enterprise WLAN. 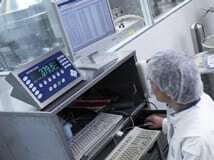 This formulation solution from METTLER TOLEDO combines powerful formulation software with reliable weighing technology and the most advanced computer technology, making it a byword for optimal process control. 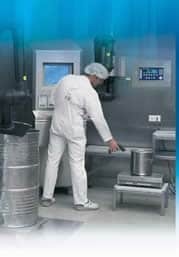 Not only does it help you meet the strict requirements of the pharmaceuticals chemicals, food, and cosmetics industries but assists the operators in their daily work. The Form-690 Application Module adds advanced features to the capabilities of the IND690 terminal to manually control the formulation needs for a configurable (not stored) formula comprised of up to 15 materials. This is accomplished through the addition of a hardware key that provides new setup parameters and sequences. Configure the parameters to either weigh several materials into a single container or weigh each material into a separate container. Utilize the counters to track the number of times a material is selected and the number of containers filled to target by the configured formula. Formula weighing: Dispensing of several components into a container – Each formula and component can be provided with an identification. Totalization: Total of all the components dispensed displayed or printed. FormXP-690 is designed to meet your manual formulation needs for stored formulas, inventory control, advanced reporting and database compatibility. 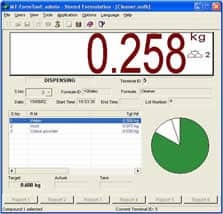 The application software provides solutions for weighing a formula into a single container, weighing individual components into separate containers, or mixing multiple batches. Alternatively the operation mode of vertical, horizontal of batch-filling can be chosen. With the FormXP-690, the IND690 gets “in touch” with the PC-World. This is made possible by the PC-Software FormToolXP, which is part of the FormXP-690. This tool is designed to enhance the efficiency of your work, since the administration of recipe data can be done easily and weighing- and application data of your processes will be visualized and recorded in “Real-time”.